My wife calls me an office furniture nerd. Those of us in the office furniture business know what she means. When I take my kids to the doctor, I flip over the chairs in the waiting room to find out the make and model of what I’m sitting in. When I watch police dramas on TV, I know the manufacturer of the cubicles the detectives are sitting at. On a recent trip with the kids to Disney World, I made a quick stop before the Toy Story ride to catch a glimpse of Walt Disney’s desk on display. There was no line. 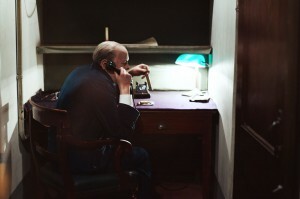 I’ve seen the cigar box on Winston Churchill’s desk in the war rooms below the streets of London. I imagine the impact he made on the free world from a windowless room at a tiny desk with a phone. I recently stumbled across this website and spent more time browsing it than I care to admit. Some personal favorites of mine are Mark Twain, Steve Jobs, and Warren Buffet. I’ve noticed that Al Gore is severely lacking in file storage, and Albert Einstein really could have used larger chalk board. But those are just my observations. We may be office furniture nerds at Arthur P. O’Hara, but we know your work space is where you make things happen. Ideas are shared, courses are charted, visions turn to reality---and sometimes, history is made. Forgive us for being so geeky about the furniture.